Every Thursday from now on, I will be writing a post showcasing some of my thrifty finds on the internet, be it ebay, Amazon, Etsy or even a high street store. I take my inspiration from the fabulous AThriftyMrs who spoke so wonderfully at Cybher. She really inspired me to put my innate thriftyness to work and share it with others. 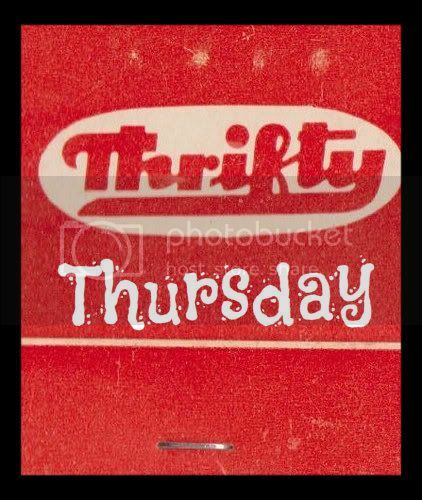 At the bottom of this post there is also a Thrifty Thursday Linky so I really hope everyone joins in and doesn't leave me all alone in my thriftyness. I wrote a couple of posts a little while ago about budget wedding ideas and came up with some thrifty alternatives to traditional wedding related stuff. I really love these "pashminas" on ebay and although some of them are seconds (there is a selection), I ordered one for myself and it is divine. These ones are £11.90 plus postage and packing and are great as a cover up for weddings or even for bridesmaids as there are loads of colours that you can co-ordinate with your colour scheme. I also LOVE these pearl earrings from ebay (new don't worry, I don't do used earrings!) I am not sure but at £3.99 can't see them being genuine pearls (but then I know nothing about such things so don't listen to me) but I don't really care as they are absolutely gorgeous. I have them in every colour, and I must confess often buy them as a gift for people and just pop them into a posh jewellery case. 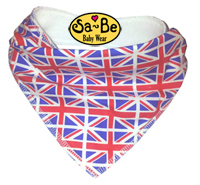 As a Yorkshire girl through and through, I really love this local company Sa-Be Baby Company, They sell really funky baby gear, and my favourite is these snazzy (a word my dad often uses) bibs. My favourite is this very "now" Jubilee style at £3.50 which I think is lovely and very very cool. Great for the olympics too. Share your fantastic finds, please don't leave me on my own. This is a first for me so hope everything works....JOIN MY LINKY!! I received no incentive to write this post. It is all my own doing! I agree with you there are lots of wonderfully cheep on ebay. New follower!